Bring a gallon of salted water to a rolling boil and cook the spaghetti. Meanwhile, mince the garlic, crumble the red chili pepper, and sauté them in the oil until the garlic begins to tan. Turn off the heat (the garlic will continue to brown; watch out, you don’t want it to blacken and become bitter). When the spaghetti are just shy of being al dente, drain them well, transfer them to the oil skillet and toss them for a few minutes to enhance flavor coalition over vivacious heat. DO NOT serve with grated Parmigiano or Pecorino Romano on the side. Some people like it, including some Romans, whereas others, especially traditionalist Romans like me, shudder at the mere idea. Only a few days left to vote this authentic Italian recipe!! Go ahead and improve my chances of being published in The Foodista Best of Food Blogs Cookbook! 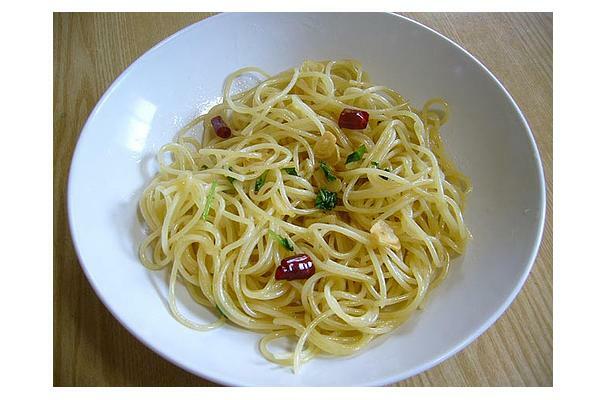 A Roman favorite, Spaghetti Aglio, Olio e Peperoncino is the Italian cook's ode to simplicity. I love it so that I have named my blog after it, Aglio, Olio & Peperoncino. “Aio e oio,” like we say – one of the most classic Roman dishes – is the one pasta recipe that all Italian men know how to make. It is also quite favored as a late night collective snack among friends, like after an evening out at the movies or the theater. Involving very few basic ingredients, Aglio & Olio is also a dish to conjure up when the pantry's empty and no one's bothered to go grocery shopping.